Designed by Isabelle Lee. This sweet little MiniMo measures a wee 6.5 inches. Wallflower is five-way jointed and handmade from mohair in a delicate hue to complement her crown of flowers. The fur on her arms has been trimmed to a shorter pile length than her tummy and head for added charm. Wallflower is perfectly weighted and the perfect size to fit in the palms of your hands or tag along in your purse! She has an unforgettable face with a tiny hand-stitched nose, glass eyes and subtle airbrushing. Her simple ultrasuede paw pads feature subtle airbrushing for added detail. The finishing touch is a delicate organza bow. 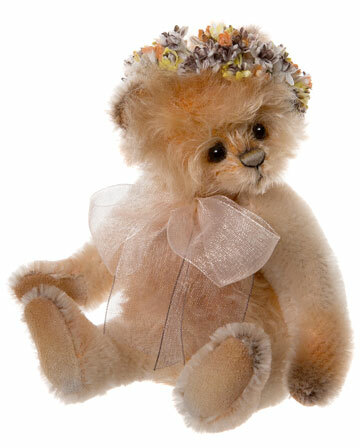 A delightful miniature Teddy bear to sweeten your collection. Wallflower MiniMo is part of Charlie Bears 2019 FOLKLORES & FABLES: Minimo Collection. Limited to only 600 pieces worldwide. Although this is a collectors item, this bear is suitable for ages 14 years and up.